Saying "Thank you", isn't something I think we do enough. I love this sweet image called Lemon Pepper from the Cottage Cuties by Elisabeth Bell for Whimsy Stamps. You know how I love some Elisabeth Bell images! Isn't she the cutest thing? I won her and just had to create something special with her. I love the little bird she's blowing kisses to and since being here with mom, I've become very thankful for the sweet chirp of the birds that gather around all the bird feeders in the yard. They faithfully come every day and we never let them down and always have something for them to eat. This beauty is colored with copics and my Close to My Heart alcohol markers (which I love by the way!) and is cutout with my Floral Ovals by Spellbinders. I inked the edges with Broken Glass Distress Ink and the gems are from Studio 112. I added some Stickles to her sweet little outfit and some Glossy Accents to the balloon. The baker's twine and the sentiment on the inside are from Close to My Heart and the ribbon is from my stash. 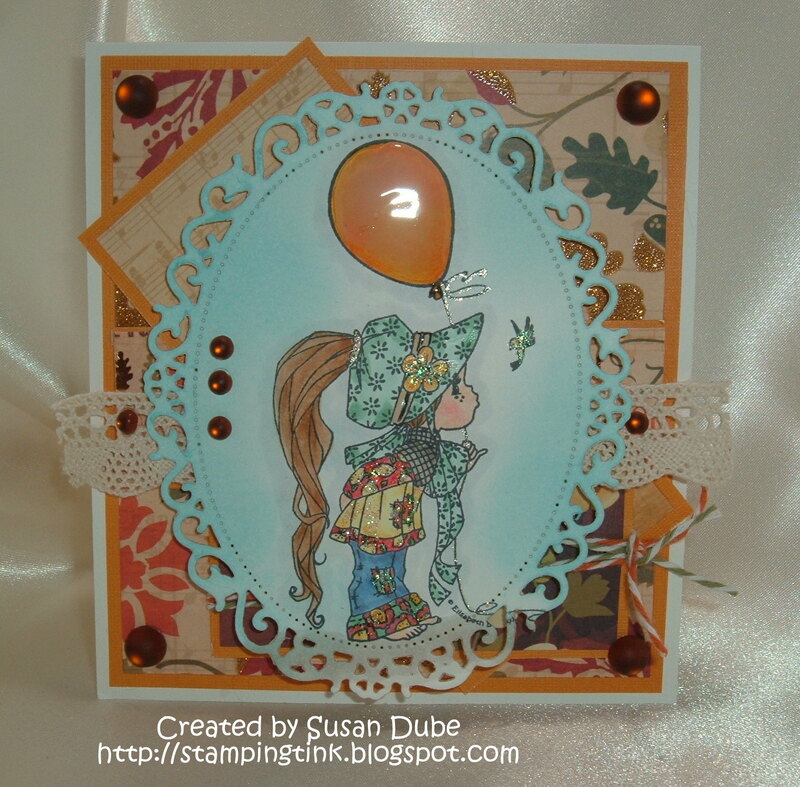 The gorgeous papers are from the Autumn Melody packs from DCWV. Make sure to stop by the Pause Dream Enjoy Challenge Blog and see what my awe inspiring and ever so talented design team buddies have come up to show their thanks. I promise you won't be disappointed! Take some time to join us and show someone some thanks. We'd love to see what you come up with! Like the coloring on your sweet image. I'm enjoying being part of PDE DT. How totally ADORABLE Susan!! Your love for the images shines through!! What a sweet sweet card!!! !